David Drake has written numerous science fiction novels and short stories, and he has contributed to several collections and anthologies. You can learn more at his website. 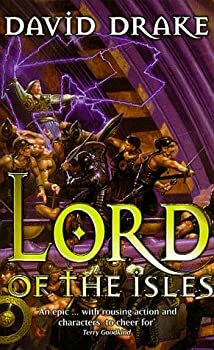 Lord of the Isles — (1997-2008) The last three novels of this series (The Fortress of Glass, The Mirror of Worlds, The Gods Return) are collectively called The Crown of Isles and they conclude The Lord of the Isles series. Publisher: In a world where elemental forces which make magic possible are rising to a 100-year peak, survivors from the last such peak begin to appear: Tenoctris, a sorceress swept out of the past; the ghost of the greatest ruler, King Carus of the Isles; and the magician who caused the ancient catastrophe. 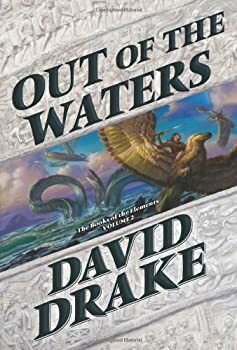 David Drake has a considerable reputation as a science-fiction writer, but Lord of the Isles was my first introduction to his work. To be frank, it is not a good introduction. Lord of the Isles begins in the tried-and-tested high fantasy tradition — ancient events outlined in the prologue, cut to the present on a bucolic location, unexceptional adolescent male character introduced, and on you go. The island of Haft in the Isles of the title is then shocked by the appearance of a ship from the past. And the story begins. The Books of the Elements — (2010-2013) Publisher: From the Bestselling author of the Lord of the Isles… In this novel of magical menace to the survival of all humanity, David Drake introduces a new fantasy world, Carce, based on Europe during the later Roman Empire. Far in the north, a group of magicians perform a strange dance on a volcanic island intended to open a gateway for supernatural creatures that will allow them to devastate the whole Earth and destroy all life. Not knowing the cause, two young men, Corylus and Varus, and two women, Hedia and Alphena, each separately pursue the answer to mysterious and threatening happenings that prefigure disaster in the great city of Carce, the center of civilization. Through magical voyages in other realities where fantastic creatures, and even gods, help or hinder them, each of them must succeed or not just the city but the world will end in fire. The Legions of Fire is the first of a fantasy quartet set in the world of the city of Carce. 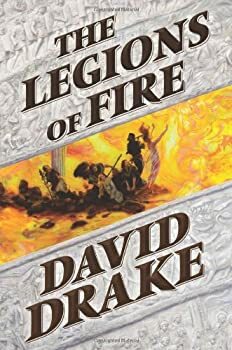 The Legions of Fire by David Drake is a mixed bag of a novel. In one sense, it’s literally so, as Drake combines historical and fantasy genres along with Greek and Norse mythology — that’s (mostly) the good mix. The not-so-great mix was in my response to the novel and its characters, which really was all over the map in terms of engagement and enjoyment. The book kept me going, though the end was a bit of a struggle, and I’m curious enough to go on to book two but not without reservations. David Drake’s Out of the Waters continues his new BOOKS OF THE ELEMENTS series set in Carce, a quasi-historical Rome. In my review of book one, The Legions of Fire, I called the novel a “mixed bag” in terms of pace and character and said I was actually more engaged by the historical setting and action rather than the fantastical elements. It was a bit of a struggle to finish, but left me curious enough to pick up book two. Out of the Waters is less mixed, but unfortunately it tips to the wrong side of the balance sheet. Hammer’s Slammers — (1979-2012) Publisher: With a veteran’s eye for the harsh and gritty details of war, David Drake depicts a futuristic analog of tank combat in his Hammer’s Slammers fiction. The Slammers are neither cartoon heroes nor propaganda villains; rather they are competent professionals engaged in a deadly business. The inevitable conflicts between policy, necessity, and human nature make Drake’s Slammers fiction instantly identifiable and utterly compelling. Tom Kelly — (1983-1986) Publisher: Professor Emil Vlasov, the Soviet Union’s top physicist, sets out to turn over to the Americans plans for top-secret anti-missile lasers in order to prevent an alien invasion of Earth, an invasion that only Vlasov knows about — or believes in. Starhunters — (1988-1990) Publisher: Take blood sport, add a touch of wonder, and you get Men Hunting Things. Northworld — (1990-1992) Publisher: The inhuman Rulers of the galaxy sent three fleets to learn what had happened to the world located by Captain North and the Survey Team he led. Neither a soul nor a message returned. The fourth time, the Rulers sent a single man: Nils Hansen. Commissioner Hansen had a mind that saw the shortest path to each task’s completion and a ruthless determination to do what the task required. The cost — to himself and whoever happened to be in the way — didn’t matter. Hanson’s Special Units had kept his planet safe from the most sophisticated and violent criminals in the galaxy. Now Hansen was being sent to penetrate a spacetime enigma which had made gods or demons of the first humans to discover it. He would succeed or die. Northworld: a place of slashing violence and mystic transformation. Northworld: a place of treachery and dazzling beauty. Northworld: a place of honor, of faith, and of love. Hansen’s iron will and strong arm confront godlike power and godlike cunning while a galaxy trembles for the outcome. And if Hansen dies — he will not die alone! Seas of Venus — (1990-1991) Publisher: On Venus, where survivors of the human race struggle to live in domed undersea Keeps, two determined soldiers — Ensign Brainard and Johnnie Gordon brave the treacherous web of intrigue in the Keeps and the perilous surface jungles to ensure the survival of all humankind. The Reaches — (1994-1996) Publisher: In a distant galaxy where immense danger threatens, desperate pirates travel to the outer limits of space, doing trade with the star colonies and encountering rivals, aliens, and strange human hybrids. Republic of Cinnabar Navy (RCN) (Lt. Leary) — (1998- ) Publisher: A Friendship Forged in Hell! Daniel Leary is a lieutenant in the Republic of Cinnabar Navy with no money and no prospects since he quarreled with his ruthless, politically powerful father. Adele Mundy is a scholar with no money and no prospects since her family was massacred for conspiring against the Government of Cinnabar. Kostroma is a wealthy planet which depends on diplomacy to stay independent in a galaxy whose two great powers, Cinnabar and the Alliance, battle for supremacy. In a few hours, diplomacy is going to fail Kostroma. Daniel, Adele, and the scratch crew they gather aren’t much to stand in the way of a powerful invasion fleet, but just possibly they’re enough. Men and women who hold courage cheap and honor more dear than life itself face impossible odds in a novel of color, intrigue and slashing action. From the corridors of a treason-ridden palace through the perils of unknown seas and hellish jungles to a final blazlng climax in space, the heroes never bow and the action never flags. They have nothing on their side but each other — and heaven help whatever tries to stand in their way! CLICK HERE FOR MORE RCN STORIES. The Dragon Lord — (1979) Publisher: Arthur, warlord of Britain, has forged a mercenary army more savage and terrible than the Saxon barbarians who have invaded his island. Victory isn’t enough: now Arthur wants to annihilate the Saxons by becoming The Dragon Lord. Mael and Starkad, an Irish adventurer and his giant Danish companion, are peerless warriors in a warrior age; men who have fought all across Europe for survival and pay and always for each other. Now they must seek an ancient skull from which Merlin’s wizardry can raise a dragon, and also the weapons by which alone the dragon can be controlled. Accompanied by a priestess older than time, their search takes them from a monster-haunted lake, to the barrow of a thing no longer dead, and to a battlefield where the enmity of Briton and Saxon rises to a cataclysm which drowns the earth in blood. Yet one task remains. The fiery breath of the dragon Mael and Starkad have helped create can sweep the land clear of all life if it ever escapes from Merlin’s control. And the dragon is about to escape! The Forlorn Hope — (1984) Publisher: They had fought long and hard, and damn near won in spite of everything. But now the men who hired them are going to sell them to the enemy… and so begins a novel of adventure in which a band of Star Mecenaries is driven across the face of a planet by enemies bent on their distruction. With only the guns in their hands, this tiny band must battle ships, artillery, treachery, and the most powerful tank in the universe. Birds of Prey — (1984) Publisher: Rome, 262 A.D: It had been the capital of the greatest civilization on Earth. Now both city and civilization are dying. Imperial unity has shattered as separatist and usurpers squabble among themselves and greater enemies gather to swallow them all. One man stands between humanity and the Long Night, matching his savage determination against a hopeless future. He is Aulus Perennius, an Imperial secret agent as tough and ruthless as the age in which he lives. Until now, though, his enemies have all been human. Killer — (1985) With Karl Edward Wagner. Publisher: Bestselling author David Drake and World Fantasy Award-winning author Karl Edward Wagner now join forces to tell the epic tale of Lycon, the greatest beast hunter that ancient Rome had ever seen, pitted against a murderous alien in a battle for survival… with the fate of the Earth hanging in the balance! Bridgehead — (1986) Publisher: There’s a secret in the basement of the engineering building. Three travelers, claiming to be from a utopia six thousand years hence, are helping Dr. Gustafson and his graduate staff invent a time transport. Their stated goal: to stop war and secure a peaceful future. Overloaded and overtaxed, the transport experiments start to go wrong. Dreadfully wrong. What the professors don’t know is that the Travelers have their own plans for the machine. And their own secrets…. The future isn’t peaceful. The past is not the past. And the machine in the engineering building has everything to do with an unimaginable war. Lacey and His Friends — (1986) Publisher: A cop in the 21st century, Jed Lacey has seen law and order imposed with cameras that scan every citizen, waking or sleeping, and computers that watch the images for any hint of crime. If they find it — it’s Lacey’s turn to go into action. A compelling combination of 1984 and Dirty Harry. The Sea Hag — (1988) Publisher: FROM PALACE… Dennis flees the crystal walls of Emath when he learns the truth behind the city his father rules. TO WILDERNESS… The jungle enfolds him, tests his sword arm with monsters and his courage with nightmares more terrible than any monster. FROM LOVE… Sword and spirit can win Dennis a princess — TO BLACKEST WIZARDRY… But he can overcome the final evil only at the risk of all he has become — and his soul besides. The Hunter Returns — (1991) With Jim Kjelgaard. Publisher: Outcasts in a land of monsters! Old Nathan — (1991) Publisher: FIVE YEARS AFTER THE AMERICAN REVOLUTION, MAGIC IS LOOSE IN THE BACKWOODS. The forces of evil are poised to prey on the folk of the hamlets and hollows: witches, demons, and red-handed men — but first they’ll have to overcome Old Nathan the Wizard. He doesn’t claim much for his magical powers, but they’re real enough for what they are — and besides, he hasn’t forgotten how to use his long flintlock rifle…. Enter the gritty, realistic world of Old Nathan, a backwoodsman who talks to animals and says he’ll face The Devil himself — and who in the end will have to face The Devil in very fact. Starliner — (1992) Publisher: The Empress of Earth. Finest passenger liner in the galaxy — Brightest link in the chain that binds the starflung civilization of the 23rd century — Six thousand lives in a single hull, trembling through multiple universes to land on raw, often violent worlds, each with its own history and wonder — The Empress of Earth. Neutral pawn in an interstellar war! When hostile necessity knows no law, Ran Colville and the rest of the complement of the Empress of Earth must bring home their ship and the passengers entrusted to them. From the Captain on his bridge to the Cold Crewmen who work in conditions that differ from Hell only by name, they’ll have their work cut out for them this voyage! Tyrannosaur — (1994) Publisher: It was the greatest predator the world has ever known, ruling the earth long before man evolved. Now man has found a way to travel back to those distant, prehistoric days. And the greatest predator of one age is about to meet the most efficient killer of another. But who is the hunter, and who is the hunted? Enemy of My Enemy — (1995) With Ben Ohlander. Publisher: Humans colonized the planet of New Hope in the Centauri system, but the planet’s name was rapidly becoming an unintended irony, as well-armed quarreling clans feuded with each other and the body-count climbed. Two of the most powerful clans, the Tuchmans and the Wings of Skywing, have been at each other’s throats for years. Patriots — (1996) Publisher: The corrupt Earth government is sending an army to Greenwood to remove the pioneers who discovered and settled the planet: the potential profits are too great to leave the world to scraggly ne’er-do-wells! Though the rugged individualists of Greenwood may be fractious and disinclined to agree on most things, the greedy politicians of Earth will learn a harsh lesson if they think the settlers won’t join together to save their livelihoods and homes! Under Yerby Bannock, who never walked away from a drink or a fight, the Greenwood patriots will face thugs in the night, lawyers in a distant court, traitors in their own ranks — And, if they have to, a fortress built to shrug off the assault of a battlefleet! Redliners — (1996) Publisher: The troops of Strike Force Company C41 were given a final mission: guard a colony sent to a hell planet. When the mission went horribly wrong, they found their lives on the line as never before. All the Way to the Gallows — (1996) Publisher: A collection of side-splitting science fiction shorts includes tales of paratrooper goblins, space cops and their politically correct alien supervisor, a band of mercenary elves, and a collaboration with Larry Niven. Balefires — (2007) Publisher: Balefires is the long-awaited collection of David Drake’s weird and fantastic fiction. Before Drake was a best-selling author of military science fiction, he was a prolific writer of horror and fantasy short fiction. Balefires collects some of his earliest professional sales (including his first sale to Arkham House.) In addition, Balefires brings together many stories set in the worlds of his fantasy novels (Ranks of Bronze, Lord of the Isles, etc.) and contains original fiction. More than just a collection of stories, Balefires features extensive story notes that chronicle the development of the writing career of one of the science fiction’s most popular writers, and provides detailed snapshots of the larger than life editors, publishers and writers that Drake has worked with throughout his career. Night & Demons — (2012) Publisher: A collection of horrific, weird, and fantastic tales by a master storyteller and creator of best-selling military science fiction. Here are weird stories set in the present, along with alternative histories filled with gritty realism and exacting detail as well as an assortment of horrors and monsters. Most of all, here are the tough heroes who throughout time master their own fears and face the very real terrors that haunt existence. Sometimes these heroes win a partial victory. Sometimes it’s enough to go down fighting. Before Drake was a best-selling author of military science fiction, he was a prolific writer of horror and fantasy short fiction. “Denkirch,” Drake’s first sale, is here, and well as many stories set in the worlds of his fantasy novels (Ranks of Bronze, Lord of the Isles, and others). More than just a collection of stories, Night & Demons features extensive story notes that chronicle the development of one of science fiction’s most popular writers, and provide detailed snapshots of the larger-than-life editors, publishers, and writers with whom Drake has worked throughout his career. The General (Raj Whitehall) — (1991-2014) David Drake with S.M. Stirling, Eric Flint and Tony Daniel. Omnibus editions available. Publisher: Long after interstellar civilization collapsed, Battle Central, a sentient computer, selected a young military officer to restore its fallen glory by conquering a planet — and then re-conquering the stars. ARC Riders — (1995-1996) With Janet Morris. Publisher: Reactionary 23rd-century terrorists will change history unless the elite Anti-Revision Command, the ARC Riders, aided by war veteran Maj. Rebecca Carnes, can find them. In a manhunt that ranges from the 26th century to 50,000 B.C., the ARC Riders must stop the killing before they lose their one chance to untie the fatal knots of time. Kill Ratio — (1987) With Janet Morris. Publisher: Space was man’s last frontier. Will it be his final background? Target — (1989) With Janet Morris. Publisher: When an extraterrestrial visitor lands on the moon seeking political asylum, everyone is caught up in studying the creature — while the alien’s hunters follow close behind, ready to kill anything that stands in their way. The Undesired Princess & The Enchanted Bunny — (1990) L. Sprague de Camp with David Drake. Publisher: The Undesired Princess finds the overly practical Rollin Hobart transported to a far-from-sensible world, while in The Enchanted Bunny, ghostwriter Joe Johnson falls into the middle of a fairy tale.